It's been a busy first year for the Educational Theatre Foundation (ETF). Launched on February 18, 2017, the fundraising arm of the Educational Theatre Association (EdTA) received a major donation from NBC Chairman Robert Greenblatt earmarked for JumpStart Theatre late last year. The program, which receives support from the Shubert Foundation and Broadway Cares/Equity Fights Aids, focuses on building sustainable musical theater programs in middle schools where there previously were none. The ETF also recently launched R.I.S.E. America (Recognizing and Inspiring Student Expression), thanks to a $500,000 commitment from NBC. Inspired by NBC's upcoming Jason Katims drama Rise, which follows the effects a high school theater department has on its surrounding community, the program grants a half-million dollars to high school theater programs across the country. The winning schools can use the grant money to cover various critical needs, including master classes and production expenses. It isn't often we come across two important theater-related announcements in such a short time from a new organization like the ETF. It's encouraging news for a nonprofit theater space that could use all the help it can get. Julie Cohen Theobald is the executive director of the EdTA and president of the ETF, and I recently had the pleasure of speaking with her regarding the ETF’s mission, the launch of R.I.S.E. America, and the role of funders in filling the theater education gap across the country. Theobald has been the executive director of EdTA since 2011, where she serves over 5,000 theater educators and 125,000 student members of the International Thespian Society with programs that strengthen theater education. The association has grown over 50 percent since 2011, and forged key partnerships with the theater industry in New York City, the entertainment industry in Los Angeles, and advocacy leaders in Washington, D.C.
Before EdTA, she spent most of her career at Procter & Gamble, where she launched the Febreze brand in 1998, which has grown to over $1 billion in sales and led the Tide detergent brand to over $2 billion in sales. In 2005, Advertising Age named Theobald one of the top 50 marketers in the U.S.
Theobald has an MBA from the University of Chicago in business economics and marketing, and a BA from Duke University in public policy. She continues to participate in community theater as an actor and musical director. "Theater Education to Every Child"
In 1929, the International Thespian Society was formed, and subsequently rebranded in 1989 under the umbrella of the EdTA. Last year, the association formed the ETF as its fundraising arm. I asked Theobald why the association formed the foundation. "The ETF is the vehicle to fulfill our vision of providing access and excellence in theater education to every child," she said. "Many corporate and individual philanthropists, as well as private foundations, support theater education programs around the country, but there is no 'iconic' philanthropy for school theater—like United Way for social services or the Red Cross for disaster relief." Theobald believes there is a burgeoning market—2.3 million alumni of the International Thespian Society and counting—for what the ETF is offering. "When an entertainment professional wants to give back, or a passionate theater supporter wants to underwrite the next generation of performing and technical theater talent, where do they turn to make a commitment that will have a rapid and widespread impact? How can they be assured that the investment will be stewarded toward access and excellence by experienced school theater professionals? "The foundation provides this channel and this expertise in theater education. We know what is needed for teachers and students to succeed in school theater through decades of experience, and by listening to educators across the country." ETF's early success is no accident. The Greenblatt donation and launch of the R.I.S.E America program came from the foundation's ability to meaningfully engage partners and alumni looking to give back. 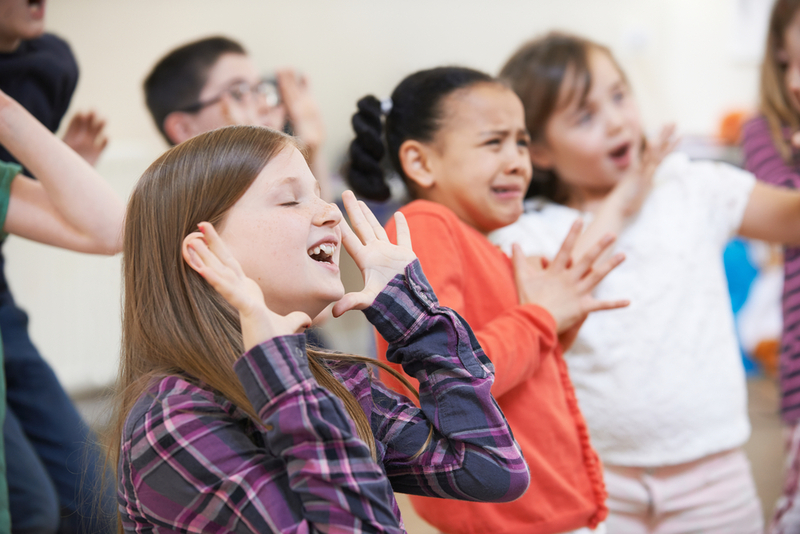 "We realized that there was a whole world of theater, media and entertainment, and other professionals who had benefitted from our programs, and we understood that school theater programs needed help. "Even those who did not pursue a career in theater look back on their high school theater program as life-changing. I’ve talked to CEOs who say they would never have gotten where they are without theater. "We took a first stab at bringing everyone together at two special events in 2015 and 2016—Broadway Back to School in NYC in 2015, and then added a West Coast program, Thespians Go Hollywood, in Los Angeles in 2016. These annual events are designed to unite current students, supporters in the theater industry, teachers, and theater professionals who want to give back. "Now, we are in the early stages where potential donors are being referred to us, and also, because of the events, some donors and potential donors are self-identifying and getting in touch." Theobald pointed to Robert Greenblatt's donation as a great example of alumni engagement translating into real financial support. And here's Jason Katims, the Emmy-winning producer behind the new R.I.S.E. America, talking about his support for the program: "From the start, I wanted to find a way to support the types of schools and students whose stories we were telling. "I couldn’t be more thrilled, or feel more passionately, about this partnership and cause," Katims said. "The support Bob [Greenblatt] and NBC have shown to help make a real difference for schools and theater programs around the country shines a light on their vital importance." We next turned our attention to how the foundation "makes the case" for theater education in schools. "We make the case through research and stories," Theobald said. "Research demonstrates that school theater enhances the 21st-century skills of creativity, collaboration, critical thinking, and communication. These are the skills that help students achieve success in college, careers, and their life, and are important qualities that leading employers are looking to develop in their teams. "School theater’s discipline and teamwork mirror life and work. In addition, everyone involved in theater has a story. For me, performing in musicals built my confidence and resilience, which has enabled me to adapt and perform in my business career. "School theater is the foundation of the theatrical and entertainment industries. We can present a strong, effective argument to the entire American entertainment industry—theater, film, TV, live entertainment and related industries—that school theater is key in creating a continual flow of well-trained performance and technical talent. "But beyond those fields, the skills learned through theater education result in leaders in all walks of life." Theobald's comments provided a nice segue to exploring the genesis of the R.I.S.E. America program. "The TV show Rise is inspired by a true story of a high school theater program and how it changed the lives of the students and community," she explained. "The writer and producer wanted to use the platform of the show to make a real difference in high schools and show that the stories on the show are not unique. "They were looking to partner with an organization that had deep knowledge of high school theater and was connected to a broad network of schools. We worked with NBC every step of the way to brainstorm and formulate the concept of the grant program, including input from an array of classroom theater teachers, to make sure it was relevant and appealing. The response so far has been incredible." Winning schools will be announced mid-March. I'd like now to step back and review some important and exportable lessons from Theobald's approach. First, she astutely noted that the professional theater community is one massive untapped pool of alumni and fans looking for an opportunity to give back. "The progress we've made to date results from networking and referrals within our community of Educational Theatre Association and International Thespian Society supporters and alumni," she said. "If you sell tickets, you have a patron base. If you have sponsors and donors, then they have friends and colleagues they can introduce to you. You have to identify and engage before asking for support." Yet, these would-be donors typically lack the prerequisite infrastructure or insight to make informed and impactful giving—arguably the biggest hurdle facing individual patrons, regardless of the performing arts field in question. So the Educational Theatre Foundation provides it. Working with institutional heavyweight the Shubert Foundation, ETF netted critical financial support for JumpStart Theatre. And following in the footsteps of others funders that have leveraged the success of hit shows like Hamilton and Glee, the foundation partnered with Katims, the brains behind Friday Night Lights to launch R.I.S.E. America, all while simultaneously touting the hard and soft benefits of theater education. Theobald is bullish about the ETF's future and the larger theater education field. "It was a huge step when NBC recently made their $500,000 commitment to the R.I.S.E. America grant program to strengthen school theater programs. So we are off to a good start. We are focusing now on identifying more major donors through networking and referrals while working on expanding our base through re-engaging thespian alumni and other school theater supporters. "One of our major interests now is seeking additional funding for competitive grants for school theater programs to continue the momentum of the R.I.S.E. America grant program. We have seen through the applications that there is enormous need out there, and impact to be made. Our opportunity is to connect that need to those individuals who are passionate about theater and can make a real difference." And as for Theobald's advice for other theater education groups? "Be patient and start where you are—in your community and with your network."